Available since August 2018, the Samsung Galaxy Tab S4 is arguably still one of the best Android tablets currently on the market (at least in the US). With prices starting at $649, the Tab S4 is not exactly an affordable device, but that's because it packs plenty of high-end features. If you've been waiting for a proper moment to purchase this tablet, you should consider getting it now, as Samsung is offering a pretty cool gift with it. 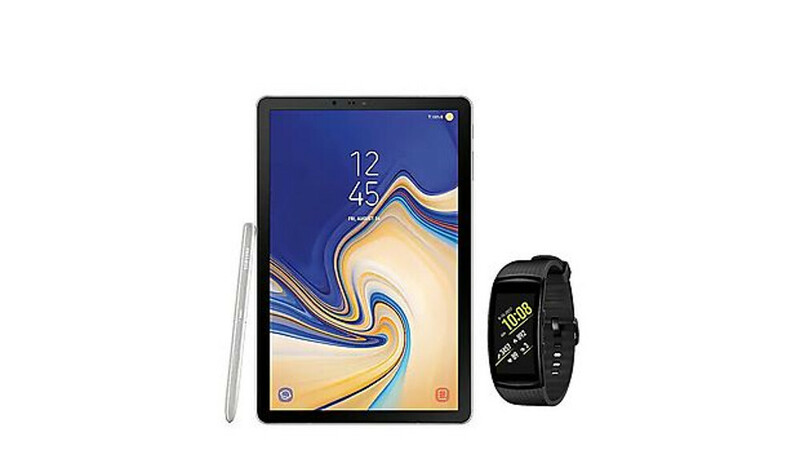 More exactly, for a limited time, the Galaxy Tab S4 comes bundled with a free Gear Fit2 Pro fitness tracker. This deal is valid only with purchases of Samsung's Galaxy Tab S4 Wi-Fi-only model, so all LTE variants of the tablet are excluded. You can get either the Wi-Fi model with 64GB of storage space (priced at $649.99) or the one with 256GB (priced at $749.99). Once you add the Galaxy Tab S4 Wi-Fi to your cart, the free Gear Fit2 Pro will be automatically added to the order. The deal is available only on Samsung's official US website and you can find it by visiting the above link. Some of the standout features of the Galaxy Tab S4 include the Snapdragon 835 SoC, 4GB of RAM, and a 7,300 mAh battery with Fast Charging support. The tablet comes with Android 8.0 Oreo pre-installed. Meanwhile, the Samsung Gear Fit2 Pro that comes at no extra cost with the Galaxy Tab S4 is currently sold for around $150. It is a can-do-it-all wearable that features a plethora of different sport tracking modes. To get the full scoop on both devices, feel free to check out our dedicated reviews. We so need more OLED screen large tablets from other companies. Samsung tablet screens have always been the best, but there tablets are so expensive. We need so much more than just more oled tablets. We need more tablets with better speakers, stylus support, HDMI/ability to dock, better software support, better tablet features built in OS and ofc better apps. Samsung TAB S4 is pretty good tablet, but if you consider price and fact they do not add case/keyboard for free anymore, you'll get pretty much into a joke territory. I actually seriously consider buying 1/2 old S4 with a huge discount. Tab S4 is the best tablet I've ever used. It's snappy, screen is gorgeous and the pen is included. Battery life is 3 days easy. Glad I got this over the new iPad! I only have one tablet that’s Nvidia Shield K1 I like it I like the Samsung tab s4 I only used it at bestbuy I love the dex feature like laptop mode where the Nvidia Shield K1 stop getting updates very said about that. $600 lot of money I was consider a Huawei Media Pad M5 has really good benchmarks half the price of Tab S4 I might consider Huawei tablet. Yep, Huawei M5 8" is probably the best replacement for a Shield you can get right now.